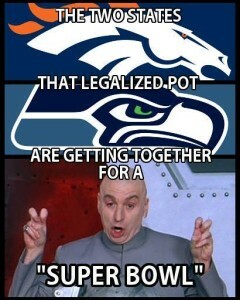 Is everyone ready for the super bowl!?!?! My Bf’s sister shared this meme to my Facebook last week, and I giggled and foolishly believed that it was a current joke. Silly me when at work I mention watching the Seahawks play. Yea, my coworkers got a kick out of that. I wasn’t so upset about having the wrong information because I particularly favor either of these teams, but rather because it was giving me the perfect opportunity to share one of my crafts. Eh, so doesn’t work as wonderfully… but it’s still football so why not. My whole family is Green Bay Packer fans, except for me. If I am going to watch a game I always root for the Pittsburg Steelers. That’s not my fault, I was living in Pittsburg when I first started watching football. With that in mind, I always blame my parents. After all they are the ones that moved me there. Well, then after a few years we moved back to the land of green and gold. In this time I started dating my wonderful Bf, whose whole family also roots for the Packers. We recently decided to pack up and move out to Washington state, which became really ironic because his nephew suddenly decides that the Seattle Seahawks are the best team out there. Knowing how it feels to be a fan on their own in a sea of Packer fans I had to help him out with some gear to represent his favorite team. For the gloves I stumbled upon this pattern that worked perfectly. I was so thankful that I was able to find this, otherwise I would have been shooting in the dark to try and make it the right size for a kid. The only thing I changed was I felt the pattern stopped short. When the pattern ends I just did a couple of rows of sc to create a cuff. 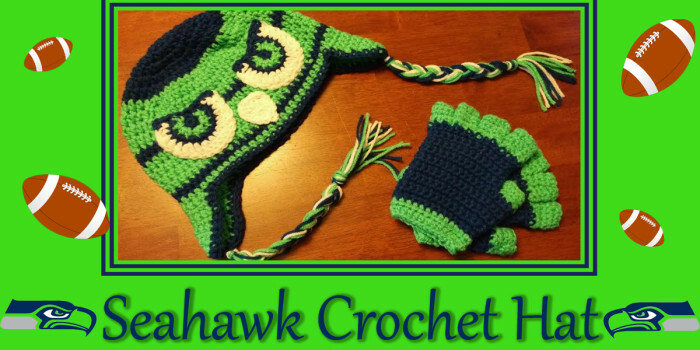 Using green and blue yarn you are going to make stripes where ever you think would look cute. 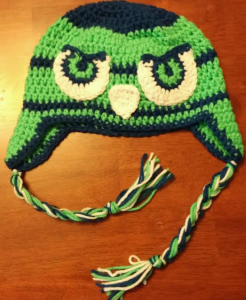 I personally like the green more so I made my hat primarily that with a few rows of blue. When you want to change colors finish the row you are on like normal, but instead of continuing on with the next row fasten off instead. Attach your new color, ch 2 and continue on. With your fist color make a magic circle. I stopped my rows of increasing here so that the hat would fit a child. 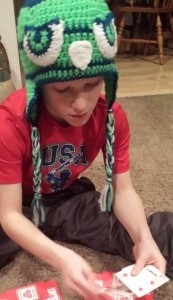 If making a hat for an adult add another row, or two, of increases to make the hat as large as you need. Use the same color as your last row. fasten off and wave in tail. To make your second ear flap count roughly 28 sts over, I’m saying roughly to leave room for interpretation. Everyone has a different shaped head, so a best fit might be a little different for you. Attach yarn and continue with Row 1. I like to make my edging in an accent color, so I used the blue for this part. Attach yarn in any st on back of the hat. sc in same st. sc in each st around, this will smooth out the ear flaps so they look real nice. sl st to join. ch 1, sc in same st. sc in each st around. sl st to join. Row 1: 6 sc into magic circle. sl st to join. Finish off and tuck in tail. Row 2: attach green 2 hdc in each of the next 5 sts. You will no longer connect any of the rows, instead just finish off. Row 4: attach whit yarn on first st. 1dc in each of the next 6 sts. 2dc in next st. 1dc in next 2 sts. 2dc in next st. 1dc in next 2 sts. 2dc in next st. 1dc in next 5 sts. finish off. Edging- attach blue on the upper edge and sc across creating a brow line. Row 4: sc in first st. ch 3. sc in next st.
Sc around the edge, 3 sc into the ch 3 space. 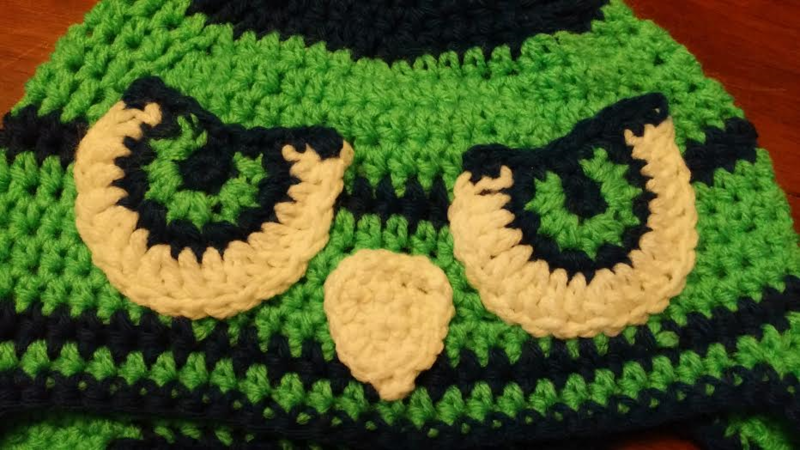 Sew the face into place using your stripes and ears to help line it up. Final touch is to add the braids onto the ear flaps. Using my arm to help measure I cut strips the length of my fingers to my elbow, 6 strips each color. Separate your strips so you will have 3 green, 3 blue, and 3 white on each side. Line them up and fold them in half to find the center point. Find the tip of the ear flap and insert hook. It will be tight but pull the center point of your strips threw the ear flap. Do not fully pull threw, you just want to make a loop. Take the tails and pull them threw the loop that was created. By pulling tight it will secure the strips onto your hat. Now braid them, and tie with a knot. Trim the ends so that they all look nice. 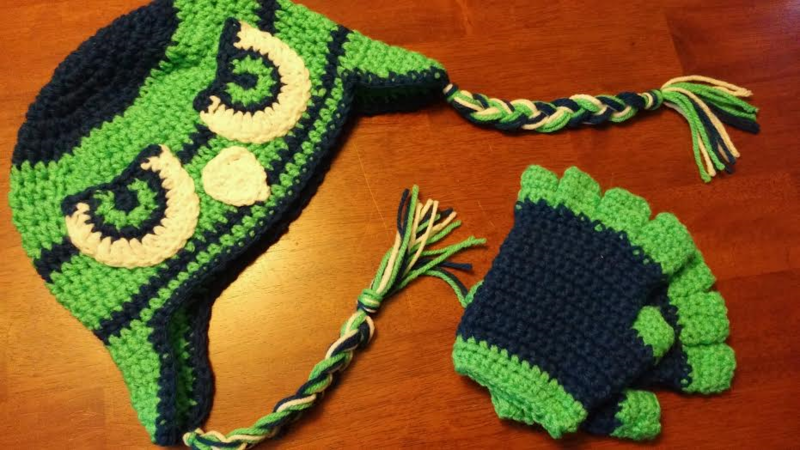 Puff Stitch Hat and Fingerless Gloves!